Bulk jewelry rope chain sold by the inch or longer footage spools. Rope chains are woven from fine wires or links for a braided appearance. 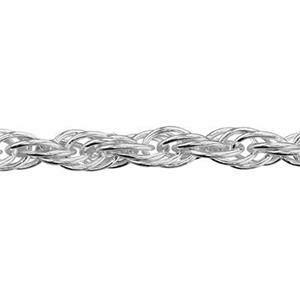 Rope chain is available in several variations: Singapore style, wheat or spiga in Italian, french rope or double rope. We recommend soldering the ends of rope chains and using lobster claw clasps for finishing. Click here to learn How to Finish the Ends of Jewelry Chain.